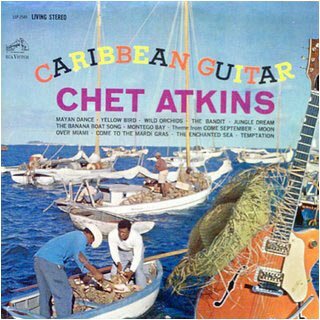 LISTENING NOTES: Tropical Delight: Chet Atkin's "Caribbean Guitar"
Tropical Delight: Chet Atkin's "Caribbean Guitar"
I had promised in an earlier post to review this special record. Like "The Other Chet Atkins" and "Chet Atkins in Hollywood", this title has been on the Absolute Sound's Superdisc List for well over a decade. That fact, combined with the legendary guitarist's enduring popularity, has kept it in steady demand. While not particularly rare, choice copies can be difficult to track down. I consider myself fortunate to have obtained a beautiful copy pressed in Indianapolis with 1S/1S stampers. I am always astonished at the complete lack of surface noise on this pressing. 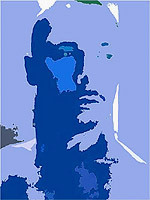 It is quieter than many of my modern audiophile reissues, and remains so after dozens of plays. You'll find this is true of many of the discs RCA issued from this time (1962). I'm finding I often prefer a "white dog" label pressing to the earlier "shaded dog" of the same title. With the LSP series, you can tell these pressings by slight changes to the label. The RCA Victor logo is white rather than silver and the words "Living Stereo" have been changed simply to "Stereo". On this album, Chet takes twelve latin favorites and gives them a breezy, tropical twist. "Mayan Dance" opens the album in an understated way - the haunting tune features exquisite classical guitar work backed with strings. The famous tune "Yellow Bird" is paced as if a gentle breeze carried it along - a beautiful, hypnotic effect. Some of the other tunes are "The Banana Boat Song", "Montego Bay", "Moon Over Miami", "The Enchanted Sea" and "Temptation". Every selection on this record is equally enchanting, in fact my only complaint is that is ends too soon. Highly Recommended!